It's always time for chocolate and with it being so versatile, it can take on many forms. We partnered with Baker's Secret and asked FBC Members to create sweet decadent goodies with Baker's Secret bakeware. 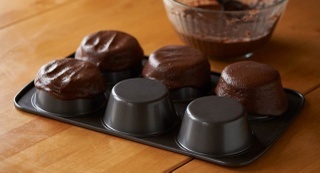 The bloggers were equipped with a 4” x 8” medium loaf pan, 6-cup muffin pan, 8" square dish, 9-1/2” x 13-1/2” cookie sheet, 9" x 13" cake pan and their imagination! The final creations ran the gamut of cakes, brownies and other treats. Enjoy these six recipes made by some of Canada's most talented food bloggers for the chocolate lover in all of us. 6 decadent recipes for the chocolate lover in all of us!